Why was the Apollo CM Much Lighter than Stated? Could underweight Apollo command modules (CMs), weighing 36% less than claimed, indicate that these modules did not actually make the specified journeys? What was the actual weight of the Apollo CM? Doubts have arisen regarding the reliability of the weight values as stated by NASA for the CMs that returned from the Apollo missions to the Moon in the late 1960s and early 70s. The details that can guide analysis of the available film/video and photographic documents are highlighted in Fig. 1. In particular, the side engine nozzles were of interest, underlined in red, the REACTION CONTROL YAW ENGINES (YE), and the front engine nozzles, REACTION CONTROL PITCH ENGINES (PE), underlined in green. The radius of the sphere can be determined in a computer application such as CorelDRAW®. A circle was superimposed on the CM image. Then, by adjusting the radius of the circle, it was possible to match the curvature of the bottom of the CM with the circle. The resulting radius was calculated by comparing with the known CM diameter (3.91 metres). In Fig. 4 the spherical segment with the specified parameters is highlighted in blue: R – the radius of the sphere, h – the height of the segment. The disk with radius Rd and height hd is highlighted in pink. The truncated cone with height hc, which was adjusted to the final volume of 0.9m³ is highlighted in green. Totalling these volumes gives 5.3m³, with a margin of error of 3% (due to the density of sea water of about 1025-1028 kg/m³), according to NASA (see Fig.1) means that the weight of the CM was 5.3 tonnes. Thus, according to the drawing in Fig. 4, the underwater level of the CM floating in an upright position must coincide with the upper edge of the green sector, and the engine nozzles (YE, PE) would be partially below the water level. The depth that the CM would sit in the water was then ascertained based on film/video recordings and photographic evidence. Fig. 6. Is the CM scale model. Fig. 7. Is the CM scale model floating vertically submerged in water up to the level of RCS nozzles – marked with horizontal lines. And Fig. 8. is the CM scale model floating with off-centre mass. 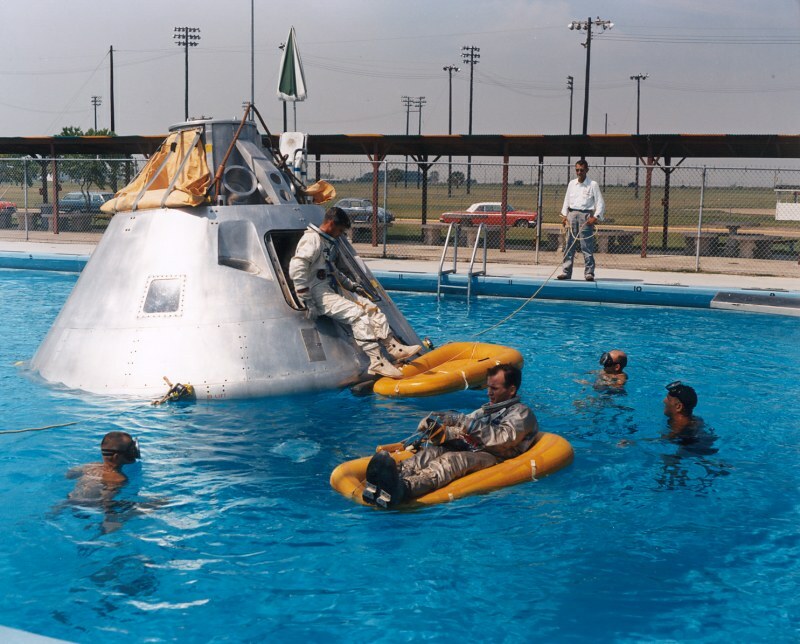 Prime crew for the first manned Apollo mission relax in a life raft during water egress training in the Gulf of Mexico with a full scale boilerplate model of their spacecraft. Both cases (Figs. 9 & 10) show that the top of the ‘curved bottom’ in the zone of the side engines (YE) was under water, and although there were no engines on the model, the depiction of the extent of the submergence roughly corresponds to Fig. 8. Correlating Fig. 12 to the drawing in Fig. 4, the weight of the Apollo 4 capsule was estimated. It corresponded approximately to the sum of volumes of the blue sector and one third of the pink sector, which is 3.2 tonnes. Again, there are no other suitable Apollo 7 resources. But even here it is clear that the YE nozzles were above the waterline, which suggest an underweight capsule. This may, however, raise the question of an inflatable raft hanging on the CM: would it increase the buoyancy or not? Elementary arguments suggest that the answer is no. Moreover, limited information did not provide sufficient grounds for full confidence in the capability to correctly estimate the CM's weight. 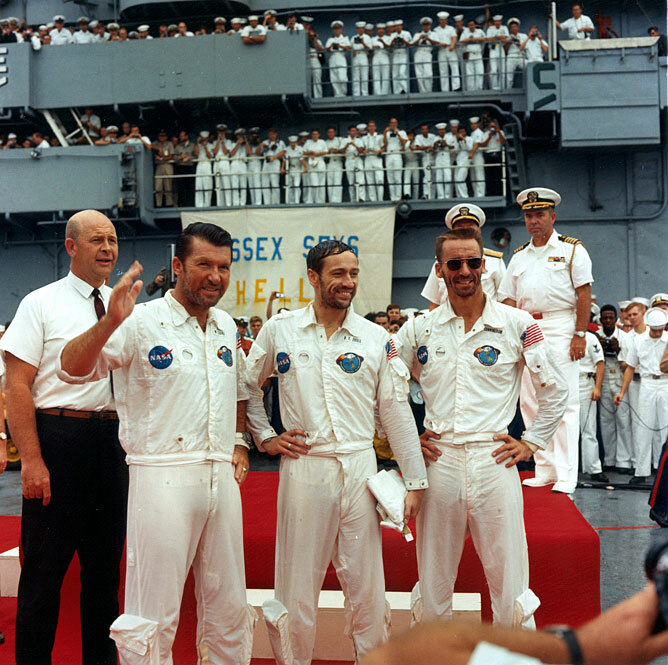 It was noted that crew of the Apollo 7 craft, (as seen in the photographs) all of whom had allegedly been in Zero-G for 11 days, looked surprisingly cheerful, showing no discomfort whatsoever from having endured such a long stay in space, a factor that must be attributed to a very mysterious and never-properly-explained phenomenon! Fig. 14 YE is high above the water level; the top edge of the curved bottom is visible, which is entirely above the surface; the black strip of the curvature itself is visible; the foam on the right is surging up from under the bottom. Fig. 15 YE is high above the water, the top edge of the curved bottom is visible which is entirely above the surface; the foam on the right is surging up from under the bottom. Fig. 16 foam surging up from under the bottom of the craft created a white rim; YE is high above the waterline; the top edge of the curved bottom is visible, which is entirely above the surface; the black strip of the curvature itself is visible. Fig. 17, the view from the other side, YE is high above the water; the right edge is hanging over the surface of the water; at the back the foam is surging up from under the bottom. Fig. 18 is similar to the previous image (Fig. 17); the strip of the curved bottom is clearly visible. According to Fig. 4, it was necessary to combine the blue sector and half of the pink sector, which matched roughly 3.5 tonnes of the CM’s weight. The YE nozzles were above the water level. Comparing Fig. 21 with Fig. 20, it can be concluded that the rocking axis in Fig. 20 proximately passed through the engine PE, which as we have seen, was also above the water surface. In this case, the depiction of the submersion corresponds to Fig. 19; for which the weight estimate gave 3.5 tonnes. Fig. 23a — left side view, b — right side view. Unfortunately there are no photographs in the archives of the freely-floating capsule. Fig. 23a shows a moment when the heavily rocking CM was ‘caught’ in a position close to vertical. We can clearly see that the YE nozzles were above the surface, which intersects the top line of the curved bottom to the right of the YE engine. We then moved the focus of our observations to the CM drawing in Fig. 24a. The waterline is shown in red; pink is the level of submersion of the vertically-floating module. From a comparison with the drawing in Fig. 4 it was concluded that it is necessary to add 2/3rds of the pink sector to the blue one. When converted to the CM weight it totalled 3.8 tonnes. Fig. 24a – the waterline for Fig. 23a, b – the waterline for Fig. 23b. In the second image of the floating Apollo ASTP CM (Fig. 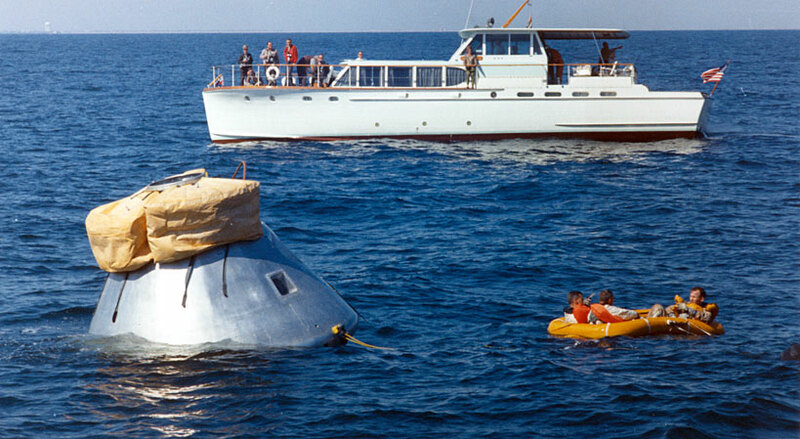 23b) the moment was captured when swimmers had somehow managed to ‘pacify’ the rocking capsule which allowed them to proceed with attaching an inflatable raft. Since it was not inflated, its effect on the CM buoyancy was insignificant, and could even make the CM heavier. A characteristic detail is thereby emphasized – the right YE engine nozzles rose above the water level which, generally speaking, was recorded in almost all of the CM pictures with an inflatable raft (e.g., Fig. 13). A curved bottom under the nozzles was exposed as well. The diagram in Fig. 24b, similar to Fig. 24a shows the observed waterline – red in colour and pink for the upright position. As these results of the measurements have demonstrated, to determine the volume of displaced water, the blue sector (see Fig. 4) and 0.4 of the pink one have to be added to each other which results in the CM weighing 3.3 tonnes. The average for the two Apollo ASTP CM weight values obtained above, results in a figure of 3.6 tonnes. In the end, the four CM weight measurements obtained were: (3.2 + 3.5 + 3.5 + 3.6)/4 = 3.5 tonnes. Thus, the assessment of the capsule’s weight carried out based on the available NASA’s photographic and film/video recordings provided the following result: 3.5 ± 0.3 tones, which is 1.8 tonnes (36%) lower than the NASA stated value. This paper has evaluated the weight of the Apollo command module, which confirms the assumption made above. 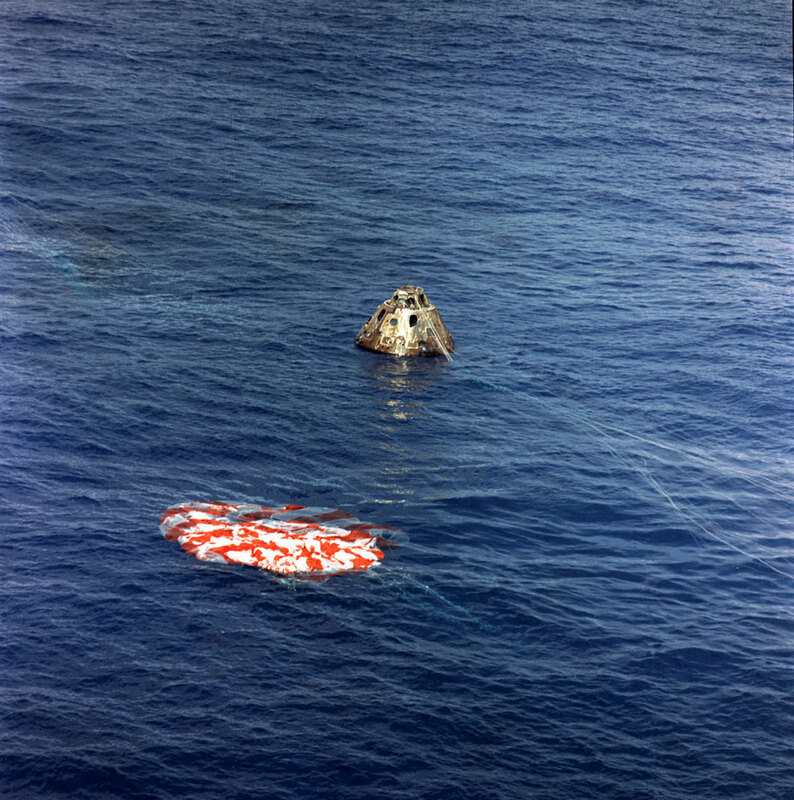 The capsule weight was found to be 3.5 ± 0.3 tonnes instead of 5.3 tonnes, as stated in NASA’s document . The method of calculation was based on visual assessment of the nature of the CM submersion after splashdown in the ocean. NASA’s photos and film/video recordings that are available to the public were used as the source of data. The significance of such pictures is that there are many in NASA’s archives and they can more accurately capture the depth of CM submersion. In particular, this image shows clearly that the upper edge of the curved bottom below the YE nozzles was above the water, and the submersion depth corresponds to the CM weighing about 3.5 tonnes, against a claimed weight of 5.4 tones. However, once again, to avoid possible objections we have made a reservation – the main calculations were made without the use of any photographic and film/video recordings with inflatable rafts. The reason for the CM’s weight discrepancy is obviously related to the fact that a lightweight version of the descent capsule was used. And in the case of the Apollo 4 CM (see Fig. 11) an even greater difference in weight was found – it ‘lacks’ about 300 kgs compared to the capsules returning with crew. The weight of three adult men to a large extent compensated for this ‘shortage’, but the issue with the ‘shortage’ of almost 2 tonnes of weight requires a different explanation. And now it would be appropriate to discuss the above-noted oddity in the behaviour of the crew of Apollo 7, allegedly returning after a long mission (11 days, which was considered an extremely long period at the time) without any signs of distress or adversity. Moreover, no Apollo crew reportedly complained about the vestibular system disorder and other ailments caused by a prolonged stay in weightlessness. This condition of these astronauts was in very sharp contrast to that observed in the Soviet cosmonauts, who had to be literally carried out of their re-entry capsules. “Coming back was [a] very difficult physical test. In space you get used to different conditions", said Guy Laliberté at his press conference in Moscow. According to Guy Laliberté returning to Earth kicks a lot of adrenaline, but "when you come out of the capsule, it seems that no strength for the next step is left". But to all the US astronauts, their landings came with remarkable ease! 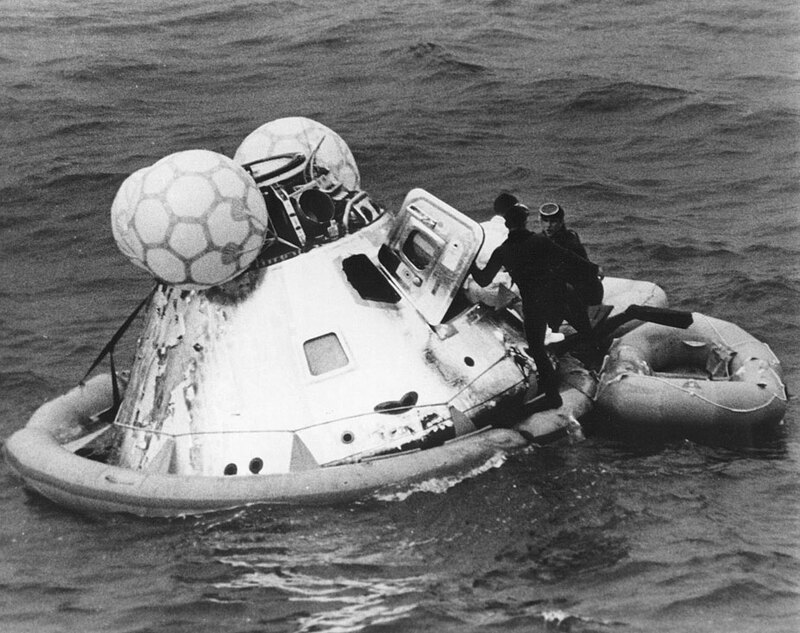 They were never taken out of their CMs helpless an/or powerless; they jumped out of the capsules entirely unaided. What can explain such a surprising tolerance by the Apollo crews to the adverse effects of space travel? The only possibilities are: either there was no prolonged exposure out in space, or the Apollo crews did not return from space at all. 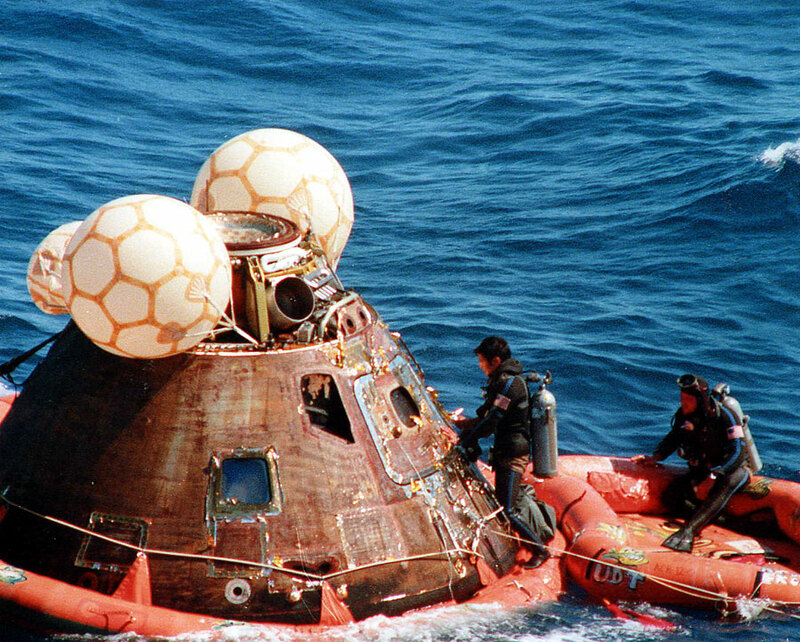 A lightweight Apollo descent capsule, as identified in this study, fits this context. If these returns from space were actually simulated, then the CM was a substitute for a fully-fledged space module, so there was no need to load it with unnecessary equipment and supplies for a prolonged space journey. A deviation of a few tens of kilometres from the landing target for Soyuz spacecraft was considered to be the norm. But even an ideal Soyuz spacecraft was often thrown by ballistic re-entry, and then the miscalculation was over 400 kms [18-20]. However, for craft returning from lunar orbit, the re-entry trajectory was much more complicated due to their higher velocity (escape velocity is 11 km/s), and it was necessary to perform either a skip re-entry or a lifting re-entry followed by the descent to the Earth’s surface. The number of factors (that cannot be predicted in advance) to be taken into account to accurately determine the re-entry trajectory were certainly higher than for a craft performing low-Earth orbit re-entry. An error in just one parameter – at a speed of 10 m/s results in a miss at the landing point of about 350 kms . Consequently, the chances of hitting a location with radius of several kilometres were practically zero. But in the special case of Apollo, in spite of everything, NASA demonstrated phenomenal accuracy – the returning craft managed to splash down at the reference points in 12 cases out of 12. Moreover, how the crippled Apollo 13 actually managed to hit the target (the miss was less than 2 km!) is known only to the late Arthur C. Clarke . The aforementioned circumstances clearly indicate the fact that NASA simulated the Apollo re-entry, dropping the CMs from a cargo aircraft , the pilot of which was only required to accurately ‘target’ to avoid hitting the waiting recovery carrier below. It is interesting to note that the above arguments are valid for the Apollo ASTP as well! Its CM weight was almost the same as for the Apollo mission models. Judging by the video recording , the crew of Apollo ASTP held fast on their feet after allegedly spending nine days in space, looking healthy and happy, cheerfully speaking at the meeting immediately after splashdown. However, during re-entry the crew was allegedly poisoned and nearly killed by toxic propellant vapours. But their faces show neither traces of any poisoning nor the signs of enduring many days in a Zero-G environment. In 1961 NASA was given the task to land US astronauts on the Moon by the end of the decade. In this race to the Moon not only was the reputation of the great powers at stake, but also the ability of world's political systems to overcome the most difficult problems. And at a time when the Soviet Union was perfecting various technical options to achieve victory in this Moon race, the US took its own route, leaving them no alternatives, the main components of which were the Saturn V booster and the Apollo spacecraft itself. However, the Saturn V had not reached an acceptable performance – the last test launch (second in a row) in April 1968 was unsuccessful , but Apollo had previously suffered an even more tragic fate – during training the crew of Apollo 1 was burnt alive in its oxygen atmosphere . NASA learned the hard way that a spacecraft with an oxygen atmosphere was a dead end. But there was no time to develop a new craft with a robust case and near earth atmosphere less than two years before the scheduled lunar orbital mission. Furthermore, the lunar module (LM) was also designed for an oxygen atmosphere, and therefore it would also have been subject to complete redesign. Robust spacecraft cases would significantly increase the requirements for the Saturn V payload, which already was not mission worthy. As a result, by 1968 NASA was left without any foundation for its lunar missions. But Americans would not be Americans if they didn't consider all possible scenarios, including the most negative – which, in the end, they had to adopt. Using breakthrough Hollywood photographic technology NASA was able to pull off an unprecedented-in-scale set of missions, enabling all of mankind to believe in the American miracle. With the assistance of the Soviet Union [25, 26] NASA successfully bluffed its way through the Moon race. But the nature of any bluff, as is well known, is the art of concealment. In confirmation of this fact NASA defiantly dumped all the previous developments which allegedly brought them the international fame and leadership, scrapping the marvellous Saturn V booster, the Apollo spacecraft and Skylab Space Station. The next chapter in its history had to be written from scratch – a ‘start again job’ – the development of the Space Shuttle spacecraft  which had nothing whatsoever to do with its famous predecessors. For purposes of clarification, the tonnes referred to in this article are metric tonnes. 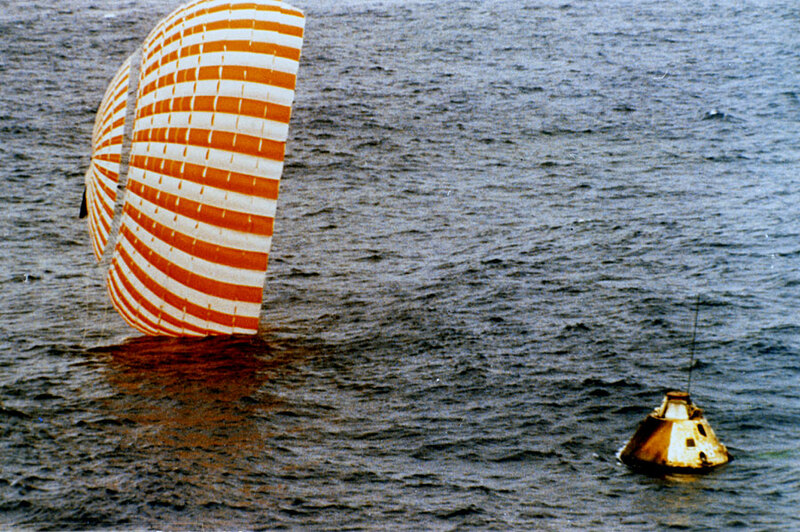 NASA’s CM weight of 5.3 tonnes refers to the splashdown weight of 11,700lbs. Documentation from North American-Rockwell states that the CM at launch weighed 12,800lbs including crew, plus 270lbs of fuel, a total of 13,070lbs. Other NASA documents as shown above, have managed to lose 70lbs/31.75kgs, saving weight any which way. 9. "APOLLO 13 - all BBC's TV original re-entry & splashdown footage – part 4 of 5"
Andrey Kudryavets was born in 1961. In 1985 he graduated from the Moscow Engineering Physics Institute (MEPhI) one of the most respected and recognised technical universities in Russia. Kudryavets majored in Technical Physics, and in 1990 he graduated in his specialised subject of Experimental Physics. He is the author or co-author of 13 research works in the field of applied nuclear physics. Since the late 1990s Andrey Kudryavets has studied history and contemporary history as a hobby. As far back as twenty years ago, like most of people he believed that Apollo landings were real. But his acquaintance with the documentary evidence shattered that faith and prompted his study of NASA’s archives and documents in detail. To date, Andrey Kudryavets has published a series of articles online exposing NASA’s missions to the Moon as a hoax.